The Street of Dreams model house in Harrisburg, Pa., is the 4,430-square-foot home that won Best in Show Overall as well as Best in Show for its master suite, kitchen and decorating. Farinelli Construction’s 2014 Street of Dreams house is a blend of several architectural styles including farmhouse and Arts & Crafts. 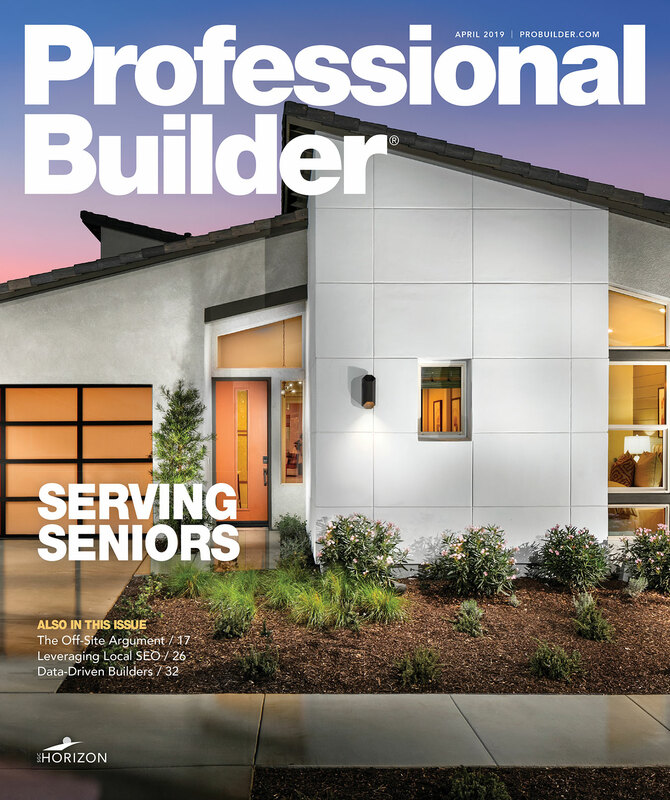 Fiber-cement siding, manufactured stone and a metal roof greatly reduce exterior maintenance. Farinelli Construction’s 2014 Pennsylvania Street of Dreams house in Harrisburg, Pa., wowed visitors with imaginative design and superb craftsmanship. The 4,430-square-foot home won Best in Show Overall as well as Best in Show for its master suite, kitchen and decorating. Don Farinelli, owner of the Mechanicsburg, Pa.-based company, gave DI the story behind this spectacular home, which is being offered for sale at $1,048,500 and includes five bedrooms and four full bathrooms. DI: I understand that the home was designed in house. What were your design objectives? Did you have a specific target market in mind? FARINELLI: We wanted to design a home that was kind of unique for the Harrisburg market. We call it the Holistic House. It isn’t just a bunch of green materials; it encompasses aspects of a sustainable lifestyle. For example, there are areas where the homeowners can grow their own vegetables, exercise, relax, and meditate. We used recycled materials as well as sustainable materials like fiber-cement siding and metal roofing, and locally sourced materials such as cabinetry. DI: How did you develop the floor plan? FARINELLI: We wanted the home to appeal to a lot of different buyers — to be a residence where you could raise a family and stay for the long term, if need be. So we put a first-floor master in it. The study towards the front of the house can be converted to a bedroom, and there’s a full bath adjacent to it. We’ve built homes in some 50-plus developments, and one thing that those buyers always want is two bedrooms on the first floor. As far as the living room, breakfast nook and kitchen, we wanted those spaces to be open to each other but differentiated. 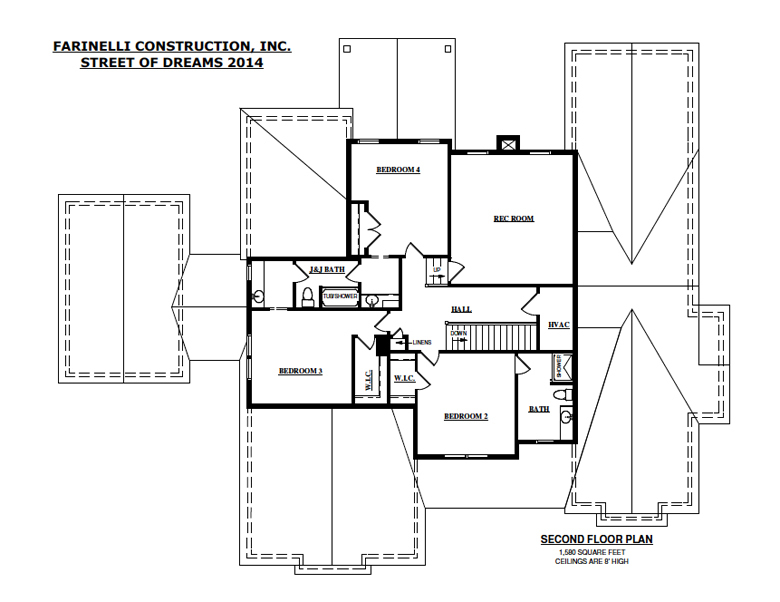 The ceiling is 10-1/2 feet in the kitchen, 9 feet in the breakfast nook and 11-1/2 feet in the living room, which provides spatial definition. 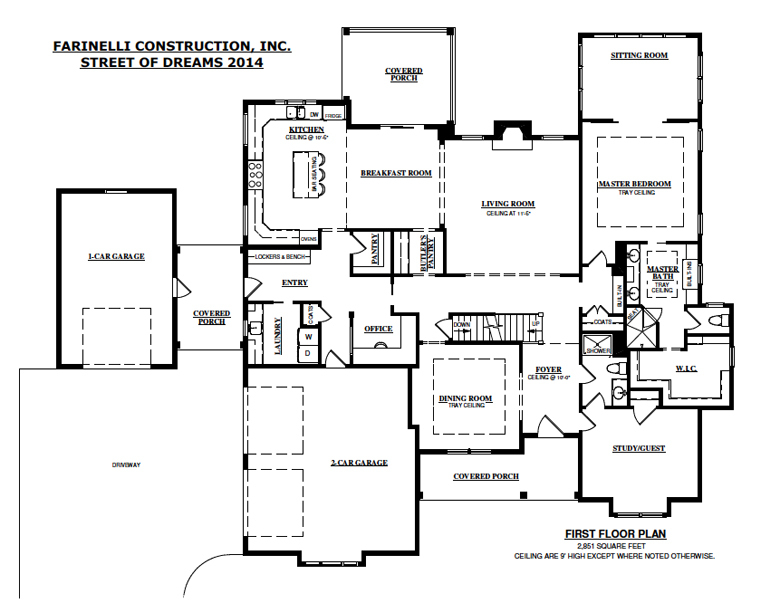 Farinelli Design Studio created a floor plan for its 2014 Pennsylvania Street of Dreams house where the owners could raise a family and age in place, hence the first-floor master suite. The study converts to an additional bedroom with adjacent full bath. DI: How would you describe the home’s architectural style? 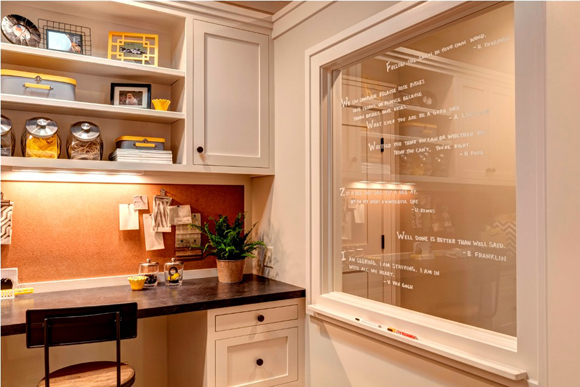 A clear glass message board in the craft room/ office and laundry/mudroom brings natural light into both spaces. All builders get in a rut and tend to build the same old thing. But there aren’t many homes in central Pennsylvania with black-trimmed windows that look kind of like farmhouse, but with a little Craftsman style. We didn’t use any trim that came from a mold. That is, there are no shapes or patterns; it’s all just 1-by material. The casing is a two-piece casing — a piece of square stock material. We took a router and put a rounded edge on it. DI: There are so many interesting details in this home, such as the cobblestones in the mudroom. FARINELLI: We obtained a truckload of reclaimed, antique street pavers and cut the top and bottom off each one. That’s what you see in the entryway’s rounded ceiling, the mudroom floor and the brick floor in the master sitting/yoga room. The cores of the cobblestones were repurposed for the front walkway. Antique cobblestone pavers were cut for the barrel-vault ceiling in the foyer. 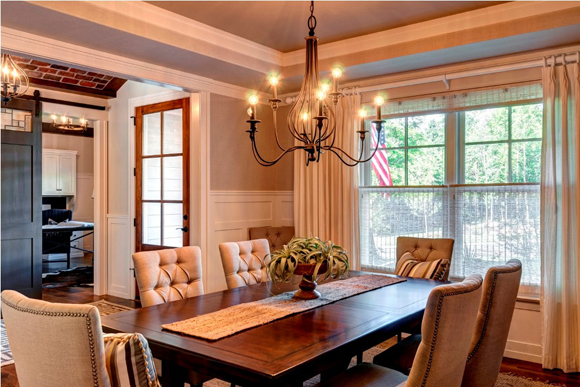 There is custom-milled, hand-distressed, center-cut white oak flooring throughout the home. The 10-inch-wide planks were laminated so we could install them without having to face-nail them. The front door is oversized: 3-1/2 feet wide instead of 3 feet and 8 feet tall instead of 6-foot-8, with a beveled-glass insert. Most of the light fixtures have LED lighting, which is kind of unique these days. Because it’s expensive, LED lighting is right on the edge of being a viable product. You have to want to buy into that mentality — are you really going to save that much on your electric bills compared to the upcharge for the LEDs? A Control 4 system allows the homeowners to operate the HVAC system, security system, audio/video, fireplace, door locks and window treatments with a phone or computer from any location. Speaking of HVAC, we used a dual-fuel system so the house can be heated with either electricity or gas. The homeowner can tweak the system depending on which fuel source is more affordable at a given point in time. DI: What was your approach to the outdoor living areas? FARINELLI: At the rear of the home is a covered porch with a mahogany ceiling and a patio with brick pavers and a fire pit. That was phase one of a landscape plan we devised. Renderings were displayed in the home showing what the back yard would look like with a swimming pool and other amenities. DI: Are there dedicated spaces that reflect your holistic lifestyle concept? FARINELLI: There’s a vegetable and herb garden on the side of the home by the laundry/mudroom. The mudroom has a brick floor so if you have some dirt on your shoes, it’s not a big deal. The laundry-room sink doubles as a potting area. Adjacent is a home office/command center with a desk and a glass message board. You can see the board from both sides and it brings borrowed light into those areas. The office also has a skylight, so it always feels as if the lights are on in that space. The yoga/meditation room off the master bedroom has a cork floor with heating that can be adjusted to take the chill out of it. The kitchen is a hard-working area designed for people who are into canning and preserving their own food. It’s attractive in a rougher, industrial kind of way. The cabinetry was designed by a local company, Colonial Craft Kitchens. 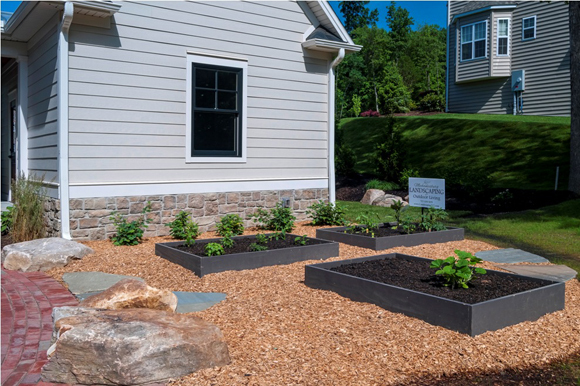 To appeal to home buyers who embrace a holistic lifestyle, Farinelli included a vegetable and herb garden on the side of the house. Mechanicsburg Landscaping and Outdoor Living did the landscape design, installation, and hardscaping. The sitting room off the first-floor master suite was designed as a yoga/meditation room, with a heated cork floor. DI: What are some of the other design details that make the home unique? FARINELLI: The foyer doesn’t have a huge, two-story staircase; instead, we tucked the stairs off to the side. But you can see the large newel post and some of the balusters. The newel post is 18 inches square instead of 6-by-6 or 8-by-8. Instead of the typical 6-by-6 or 8-by-8 newel post, Farinelli made theirs 18 inches square. We were able to create a 10-foot ceiling in the foyer by putting a step in the bathroom above it. That’s a cool little feature everybody loved. The three-car garage is split into a one-car garage with a covered porch that leads to the mudroom, and a two-car garage adjacent to a larger covered porch leading to the front entry. DI: In addition to the architectural design, what other aspects of the project were executed by your company? FARINELLI: Farinelli Design Studio did the interior design. 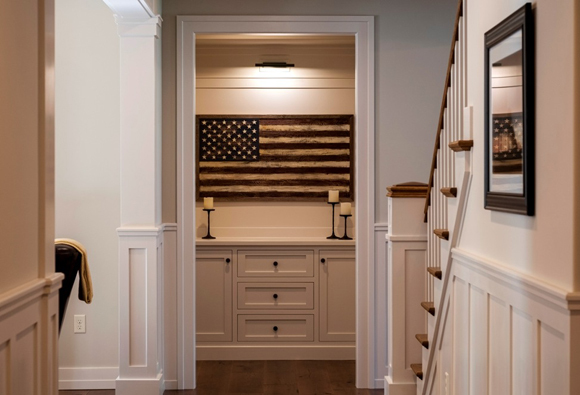 Our cabinet shop designed and fabricated the paneling and trim work, built-ins, and bathroom cabinetry.